Welll, I can't believe it is already March. Time is speeding by. It did come in like a lamb though, I sure hope it stays that way. A week and a half ago we had another snow storm, 20 new inches on top of 5 or 6 left over from the last storm. I couldn't clean the driveway, because I didn't have anywhere to put the snow. And yes, Janice still sits in Florida complaining because it goes down to 50 degrees at night. Enough about the weather. LET'S TALK QUILTS. We have pictures to share. Janice has a Christmas Quilt cut out and sitting on the floor. It is missing a couple of peppermint candies and it is going to have some great embellishments on the trees. It is made with Moda's Basic Gray "Figgy Pudding." The fabric will be in stores in June. This will be the only sneak peak. 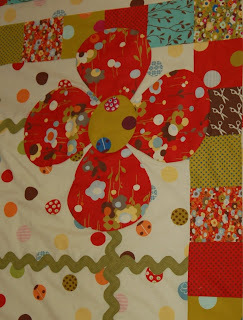 We are debuting this quilt at market. 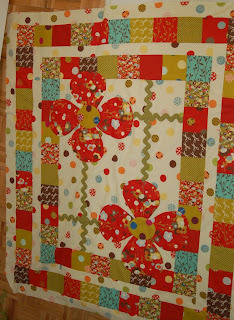 The fabric is beautiful and the design is so festive. We will have completed pattern ready in May. Next on the floor is the quilt being made out of Anna Maria Horner's Garden Party. I just love this fabric. When it comes to design, you always have to be ready for changes. I started with an idea, I posted pictures a couple of weeks ago for the quilt. I got it all finished this week, and I just wasn't happy with it. I tried all kinds of ideas, and ended up ordering more fabric. I finally decided on the changes and did one block for practice and it still wasn't giving me the look I wanted. So as I have done for the last three weeks, i set it to the side and started working on something else. Then, two nights ago, I was designing on the computer. I had drawn a simple idea that I had had and realized the the Anna Maria quilt would work perfectly. Here is where the fun started. 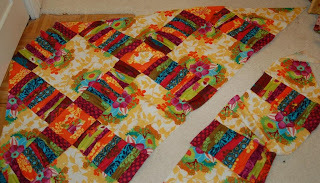 I began unpicking, yes, unpicking the entire quilt and now I am sewing in back together in a different configuration. I basically put the same rows on point and I just love it. It will be finished tomorrow and shipped off to Janice for quilting. 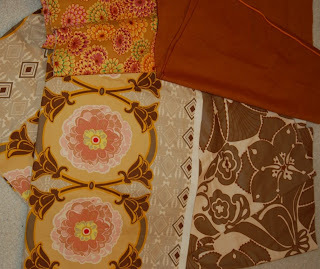 I picked up some beautiful fabric yesterday, Anna Maria Horner again, only from her new home dec line. I grabbed a couple of Kaffe Fassett pieces to go with it. Can we say a new bag. Can't wait to start on that project this week. Now, for the most important part of this blog. We need help naming a new quilt. I finished it Thursday and it is in transit between Utah and Florida. Janice has the quilting machine ready the minute it gets there. Why the rush. It is out of Moda's MoMo collection "Wonderland" and it will be in the stores this month. It can be made from any collection however. 77 charm squares and a little yardage is all it takes. I took it to one of my local shops before I shipped it and they loved it. Fun, cute and easy. Now, the dilemma, WHAT TO NAME IT. So, tell us what you think. We love your opinions. The pattern will be ready to purchase in two weeks. I vote for Glad all over! I love all your new projects. I vote for Glad All Over, too! Gotta go with "Glad all over", it totally fits! The other quilts look great too. I think you naming it Glad All Over. That was my choice before I read the other comments. I saw this in person, finished, it is awesome.